Apple’s iPad has been the poster child of the “post PC era” ever since its inception. As the device has matured however, it has gained competition from practically every company that can build a hardware device, from Microsoft to Samsung. Its reviews have gone from praising it as the harbinger of the post PC era to how its interactions are broken to a point where it will never serve the generic handheld computing device purpose it was once slotted into. At least by the media. I agree with the sentiment. For a majority of the use cases, the iPad and others of its ilk will do just fine. But as we start to mature in our use of such devices, the simplistic interfaces that exist today just won’t cut it. What we need next are methods that make this device even more powerful than it is today – and that is by unleashing a whole new series of content creation paradigms. Think about spreadsheets – Microsoft Excel for iPad has *just* been released – four years after the original iPad came out. And we still can’t run macros on it. Because of a policy decision somewhere in the Apple ecosystem, the most dominant end user programming language that comes with Excel is unusable on the tablet – which completely undermines one of the most powerful features that desktop Excel offers. And more importantly, not one spreadsheet with macros can run on the iPad – effectively rendering Excel for iPad useless for cross computer collaboration. Lest one think spreadsheets are an isolated case, consider the work flow in writing this blog post and publishing it. Once I figure out what I’m writing about and what the essential facts I want to convey are, my flow is mostly split between composing text in a text editor, and using a browser to do research – gathering quotes, images, et al and somehow embedding it in the post. A trivial task on the desktop, with the availability of quick app switching, lots of screen real estate, and simple to use copy/paste. Not to mention having persistent storage on your hard drive. On the current tablet model, this simple task becomes needlessly complicated. The drawback of being able to run only one application at a time means that more time goes switching between apps than does in actually getting effective work done. The next big revolution has to be in defining paradigms for these oft used, non trivial interactions in the touch world. The company or product that lights the way in doing so will capture a significant portion of mind-share and, hopefully, the market. Which is not to say there aren’t a few positive trends in this direction – Hopscotch, a programming application for kids that allows one to build an iPad app from within an iPad is quite excellent. For the first time, you can actually use the tablet to create content for it. But it’s early days yet. This week saw a couple of interesting developments in the world of tablet computing though. Microsoft released the Surface Pro 3 which, as per almost every review I’ve read so far, is being hailed as a laptop killer. After looking at videos, pictures and specs, I’m inclined to agree. It can run all kinds of native windows applications, offers a solid keyboard, a stylus for precision work and a form factor that makes it not appear as a compromise as Microsoft’s earlier tablets were wont to do. But one of the biggest disadvantages is that it tries to replace a laptop – meaning it offers a sleeker, thinner, lighter, touch screen enabled version of a traditional laptop that can compete in the ultrabook market. But there’s no innovation in the touch interaction arena there. In my book, that is a mistake. Mary Meeker released her State of the Internet presentation, arguably the one presentation in the year which seems to be an event unto itself. 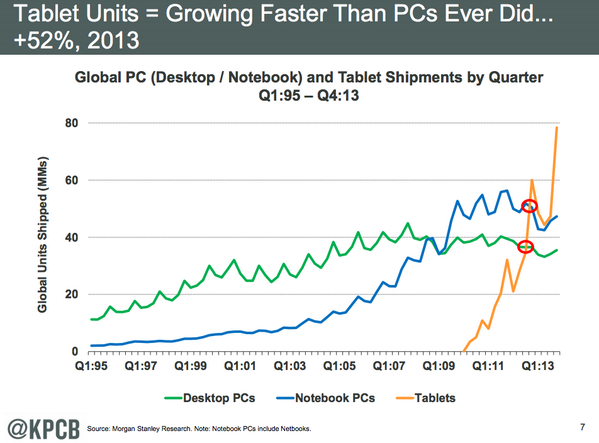 In it, she presents a chart that blows away the recent meme of “tablets have peaked and are dying” – almost 80 million tablets were sold, which equals the combined numbers of desktop and laptop computers! What this means is that all of a sudden, Microsoft has a tablet that rivals a macbook air in the kind of functionality it offers. You can run full apps on it, and it offers a trackpad to do finegrained manipulation. Apple on the other hand has an entrenched tablet that hasn’t really moved the needle recently in terms of game changing features, and offers watered down versions of full scale desktop applications that the Surface can run. What we’re missing is someone to show the way on what the next generation of tablet interactions are going to look like. I was just thinking about this the other day! anofi-Aventis just unveiled the iBGStar: a stand alone blood glucose monitor that can plug directly into your iPhone and iPod Touch. The device, which builds upon the existing diabetes-tracking technology WaveSense allow diabetics to test their blood sugar levels on the go, record notes, and send information to their healthcare providers via a free iPhone App.